A young German toolmaker Richard Müller arrived in Copenhagen, Denmark, in the 1890s. He found a job, fell in love, got married and decided to settle down in Denmark. Richard Müller did well in his new home country - he was a skilful toolmaker and had an enterprising personality. In 1901 he had saved up sufficient capital enabling him to establish his own company based on his tool making skills. The business concept for the new company was based on Richard Müller's idea that it was not enough just to make production tools. The company should also undertake the subsequent production of the materials for which the tools were made. The business concept was extended to include perforation as long ago as in 1906 - only 5 years after the start. The technology itself was very similar to that of punching, and the two lines of production supplemented each other. The company grew steadily and quietly. Richard Müller had the basic principle that debt was an evil, and therefore the expansion took place at a controlled and measured pace. In 1925 Richard Müller became seriously ill and unfortunately died when only 52 years old. His son Ernst Müller had been trained as a toolmaker in the company, and he took over the leadership when he was 26 years old. Ernst Müller followed in his father's footsteps with strict principles not to spend more than he earned, and so the company continued to operate entirely in his father's spirit. The company was run as an individually owned company from its establishment until 1936, when the activities were so extensive that in 1936 Rich. Müller was converted into a limited liability company with Ernst Müller as the controlling shareholder and managing director. An example of Ernst Müller's social consciousness was that the company introduced paid holidays around 1930, the first company in the metals industry within Denmark to do so. Although three paid holidays a year does not appear to be much today, at that time it was a pioneering initiative. Paid holidays in general were legally not introduced in Danish industry until 1938. In 1960 the company had developed an entirely new technology enabling perforation in the full width of the coil. This is what we today call all-across press technology. The professional competence of the company was now so advanced that, besides making the perforation tools, the company decided also to build the perforation machines, both the above mentioned all-across presses and sectional presses. The next generation change also took place during these hectic but exciting years. Ernst Müller and Mrs. Müller established the Rich. Müller Foundation in December 1965 transferring the majority shareholding to the Foundation. During the years from the early 60s to the mid-60s the company had established considerable export activity, but it was relatively sporadic and mainly concentrated around Scandinavia. In expanding the business the purchase of new companies started on 15th May 1972. Momentum was fast, some companies were bought and new companies were established. These companies were gathered in the holding company RM Industrial Group A/S (RMIG) in 1978. 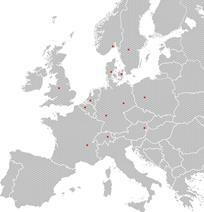 The management of RMIG were swift to see the opportunities in establishing a European network of perforation plants, not just in northern Europe, but all over Europe. 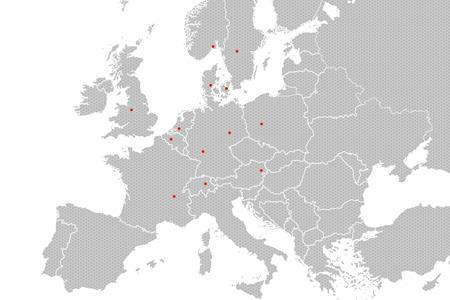 RMIG has local representation in 13 countries in Europe, with a total of 15 sales offices/production units, plus other local representatives in many overseas countries and is the world's largest manufacturer and supplier of perforated metal. The experience and knowledge we have gained within the various application areas where our products have been used for over 100 years, allows us to serve as a reliable partner for you, finding the right solution to your needs.